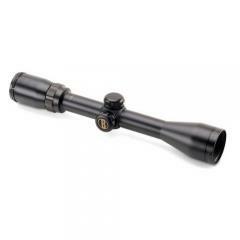 This premium variable-power riflescope from the Bushnell Banner is designed for use with black powder weapons, allowing you to turn a traditional firearm into a modernized hunting machine. Its rugged one-piece tube is built to resist recoil, and features a nitrogen fill for complete waterproofing and fogproofing. Its premium lenses feature a Dawn & Dusk Brightness multi-coating that maximizes light transmission, providing a clear and bright image even in the early morning and late even where other scopes would struggle. The fast-focus eyepiece and fingertip windage and elevation controls make it easy to engage targets at a variety of distances, making difficult shots routine.